Whether you’re celebrating a life event or just want an excuse to feel like royalty, a high tea (or afternoon tea) is the perfect occasion to indulge in dainty pastries and a good pot of your favourite tea. Cape Town luckily has a great selection of high teas and of course, we would recommend you try them all. Here is our top ten to get you started. Location, location, location… that’s the selling point at the Silo Hotel. Their incredible views over the V&A Waterfront, Table Mountain, and the harbour is unbeatable. To boot, they’re also located in the same grand building as the Zeitz MOCAA, which in itself is a must-visit. The snacks and teas are perfectly fitted to the iconic setting. You can start with a glass of bubbly on the roof and work your way down to the hotel, where you can enjoy delicious pastries and some of the best macarons in Cape Town. They have both an Afternoon Tea and a Royal Tea, with the latter including a wider selection of dainty treats. Awe-inspiring views and some of the best scones you’ll ever have await you at the Twelve Apostles Hotel’s Tea by the Sea. The hotel’s unique location at the foot of the Table Mountain range, with a view stretching over the Atlantic to the horizon makes it a truly unique experience. They also have a vegan high tea on offer and their high teas are served from 10 am till 2 pm. The elegant Pink Lady in the heart of town is always a spectacular idea. Experience old-school grandeur with their sweet treat buffet and a varied selection of teas at the Mount Nelson’s evening tea. They also have great South African treats on offer and it’s impossible to not feel glamorous in their sophisticated indoor space, on the patio or in the luscious green gardens. The cakes are highly recommended and in winter you can order a pot of hot chocolate that will warm you right up. With their colourful and inspiring decor, the Stack is certainly one of the boldest places for a high tea in town. Located in an old converted mansion that has been refurbished to perfection, you can enjoy tea and treats on their balcony with a view or in their vibrant indoor area. Their offering is good value for money and their French Bistro-style food is exquisite. Handmade chocolate seals the deal and if you love good cocktails you might even want to stay on for some of those too. This beautiful restaurant in Constantia has an exceptional setting that will make you feel like you’re sipping on a cup of heartwarming tea in an actual greenhouse. Multiple tiers of sweet and savoury snacks will grace your table and they also have a low-carb high tea available. The high tea is a great way to experience the restaurant before committing to one of their phenomenal ten-course meals. With a convenient location right next door to the V&A Waterfront, the Cape Grace gives you the feeling of being in a different place and time while Table Mountain is still in view. The hotel takes great care of its guests and your every need will be catered for. 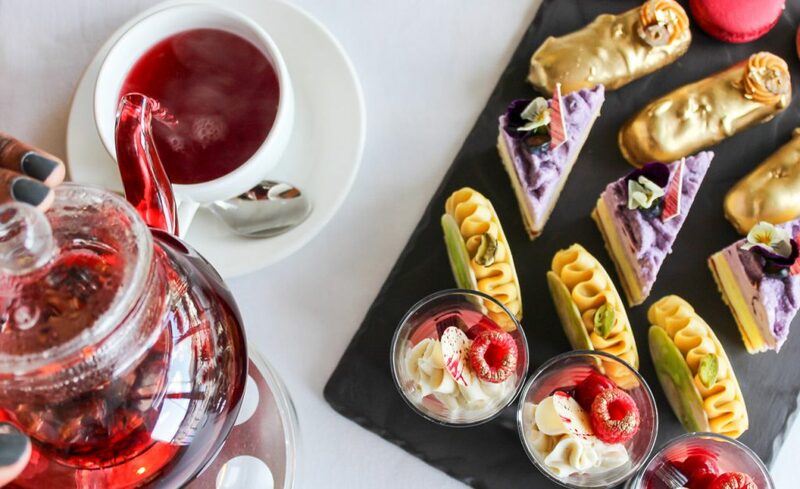 Enjoy a selection of tasty teas (from traditional to exotic to fruity) and feast on a multi-tiered tray of savoury treats (like scones, cucumber sandwiches, and salmon) as well as beautiful and dainty pastries. If you’re lucky you might even spot a seal frolicking in the water just outside your window. 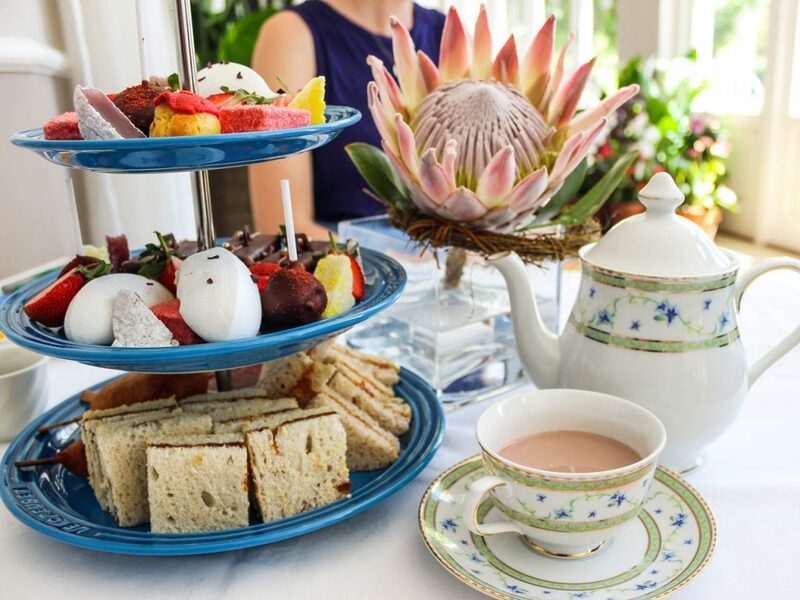 The Garden Lounge at the Vineyard in Newlands has an afternoon tea that includes a selection of tasty cakes, pastries, and savoury bites inspired by local culture and flavours. Served between 3:30 pm and 5:30 pm daily, you’ll also have your pick of local botanical teas and their passionfruit cheesecake is what dreams are made of. The hotel is a historic spot, founded by Lady Anne as a country cottage here in 1799. Take advantage of the beautiful surroundings while you’re there and take a walk in the hotel’s historic, riverside gardens overlooking Table Mountain’s eastern slopes. The beautiful Oranjezicht surrounds and elegant decor makes the Manna Bay high tea an exclusive and classy affair. The treats are decadent and the tea includes a glass of bubbly too, so it’s the perfect spot for a celebration. Booking ahead is advised. The Rhodes Memorial Restaurant wins the prize for the biggest scones with a view as well as the most family-friendly high tea location. Its setting at the foot of Devil’s Peak gives it some of the most spectacular views of the city and beyond. They also have Buchu tea and a delicious greek platter on the menu and they offer serious value for money. Cape Town has some spectacular picnic spots where you can sit and have your very own high tea with a view. Pack your favourite local tea and stock up on treats, and head to Signal Hill, the beach, or a park for a special afternoon out. For dainty pasties get a takeaway from Coco Safar, for healthy treats try Honest Chocolateor Raw and Roxy and for baked goods and cakes pop by Tessa’s Bakery, Jason’s, The Velvet Cake Company, or Charlie’s Bakery. Conveniently, the Woodstock Gin Company also has a High Tea flavour infused with rooibos, perfect for this occasion.